So very COOL! 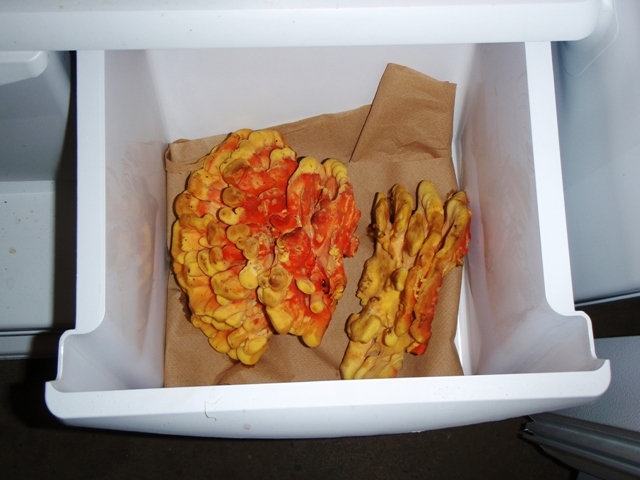 The Gardeners here in High Park found a little forest treasure today … it’s called Chicken Of The Woods. 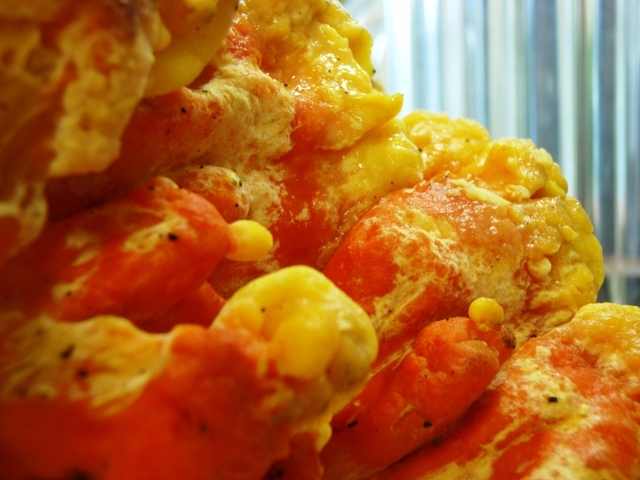 It’s an edible fungus that tastes surprisingly like … chicken. As you can see the human race is not overly creative when it comes to naming stuff! Please Remember – Never eat mushrooms or fungus unless you are 110% positive that it is safe and you know what you’re eating!!!!! (yes this warning requires 5 exclamation points!)! Also here’s another reminder that it is considered illegal to remove anything from a national, provincial, municipal park or conservation area. As you can see they’re not small! These things can grow quite huge, especially in warmer, wetter climes. 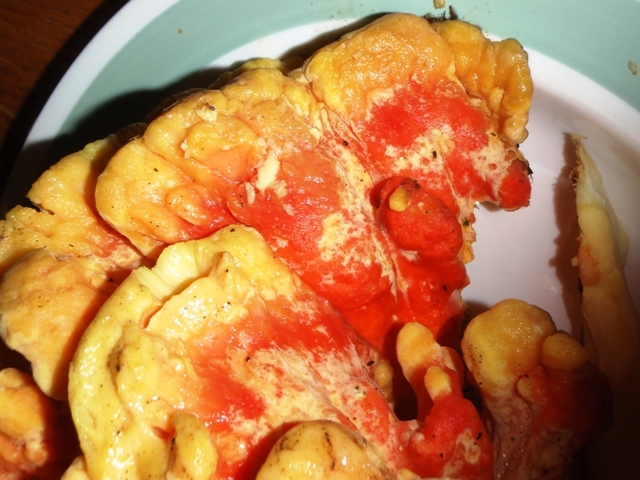 Some people have sensitivities to this fungus when they first eat it … another fun fact … it makes a great orange die for wool. 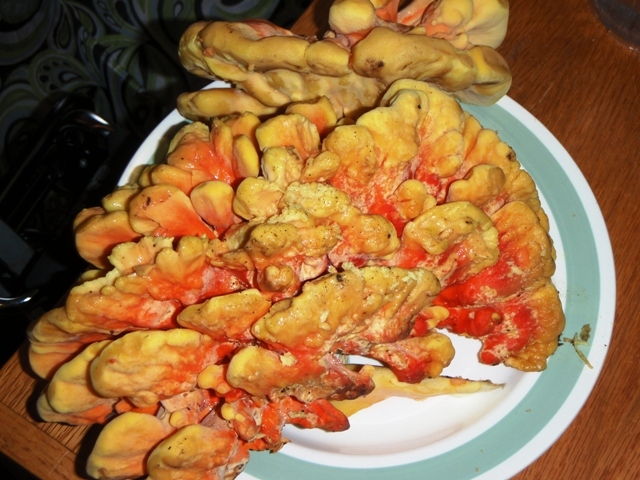 There are a number of different recipes online that use this fungus as an ingredient. Our suggestion … have fun with fungi tonight and hit your local store or farmers market and pick up your favourite mushrooms. Make it a focal point for your meal. One last fun fungi fact … the majority of mushrooms you’ll find in the grocery store are almost always locally grown! 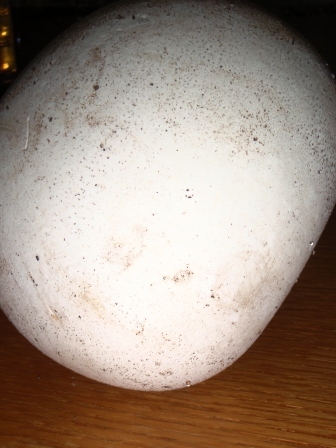 Update: Apparently the mushrooms just keep coming … this time it’s a Puffball. They can get to be the size of your head here in these parts, much bigger still down south. This one’s about the size of a softball. What’s also amazing is just how quickly these things can form in the right conditions. 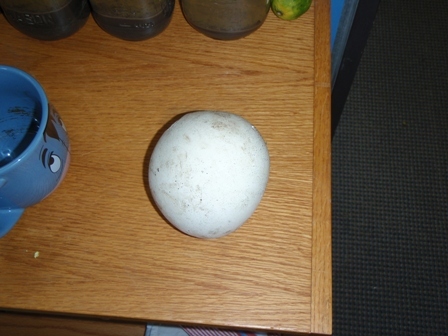 While working down around Chesapeake Bay one summer they popped up overnight and many ended up being about the size of soccer balls! Next Post A Vote For Us Is A Vote For Solar Powered Stir Fries!